Waterhog Diamond Cord Mats are the most aggressive Waterhog Door Mats in the industry. Due to their distinct diamond pattern, these entrance floor mats are very effective at scraping shoes clean of dirt, debris and moisture. • Waterhog Mats feature a water dam border that can hold up to 1.5 gallons of water per square yard and thus help keep surrounding floors safe and dry. • The Waterhog DiamondCord surface is constructed from an anti-static polypropylene material that dries quickly and does not fade or rot, making this Waterhog Entry Mat a perfect floor mat for both indoor or outside locations. • These Waterhog Door Mats can be cleaned by vacuuming, hosing off and hanging to dry or any extraction cleaning methods. 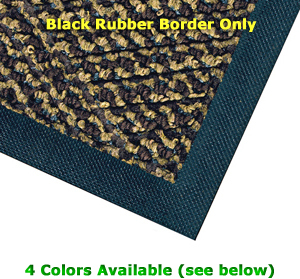 • Waterhog Diamond Cord Mats are now made with 20% recycled content.